When the weather is bad, Superintendents must make the right calls to avoid consequences like this. Superintendent Frank Sherburne stopped by one day in December to chat with Ms. Lannin's journalism class about snow days. 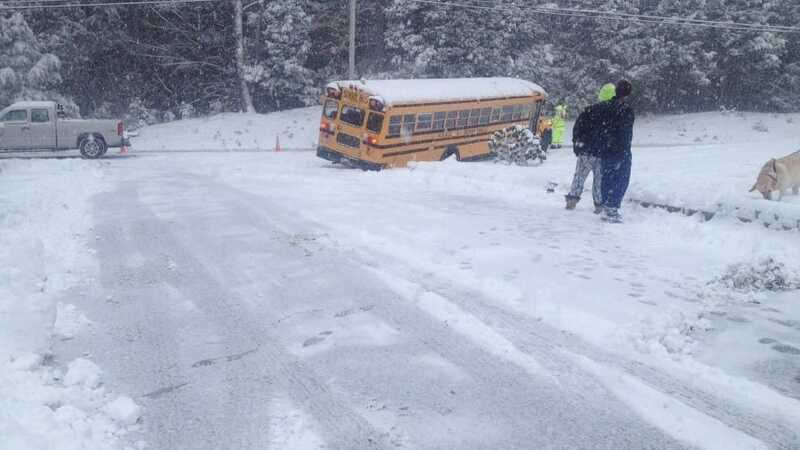 There had been complaints from students and parents that a snow day should have been called the morning of his visit because some roads were not well-plowed after an overnight storm dropped about four inches on the region. The following is a Q&A based on that interview. Eagle Times: Thanks for stopping by Mr. Sherburne. We've written about complaints concerning snow days in the past. We are wondering how those decisions are made. Mr. Sherburne: Well, this morning I was up at 2 a.m. ... By then, Bill Ellis is out driving around to evaluate road conditions. At 4, we consult with Charlie Lopresti at Channel 13 to find out whether or not we’re going to run into any issues. I also call on other superintendents – focusing on PATHS in Portland. Transporting those students is something I take into consideration. Usually, we make the decision by 5 a.m.
Eagle Times: Was the decision to open school today difficult? Mr. Sherburne: If we got four inches we were lucky. It wasn't snowing at 2 a.m. because I checked. Eagle Times: Our district covers such a wide area. How does that affect decision-making? Mr. Sherburne: There is a noticeable difference. What’s happening in Standish might not be happening in Hollis ... The secondary roads are the issues. We have a lot of dirt roads, camp roads. But we have the geography covered. Bill Ellis comes in from Hollis. I cover Limington. Dottie’s (Dottie Muchmore) covering the east. Our transportaiton coordinator talks to town road commissioners and I get on online to see who else is cancelling around us. Eagle Times: There seemed to be a lot of complaints about the decision to have school today. Did you get many calls? Mr. Sherburne: I was quite the chat on Twitter last night, according to Mrs. Napolitano (the assistant principal). I can tell you that whether I call off school or don’t call off school I get the same number of complaints. I'll get 10-15 calls on a snow day when I cancel. If I don’t cancel, we get 10-15 calls saying, "Why didn’t you?" Typically the complaints are about the fact that many of our students transport themselves. My response is: If you feel it’s unsafe, you should take the bus. We pay a lot of money to transport students. If you and your parents feel it’s unsafe, don’t come to school. Use your judgement. Eagle Times: But if you don't come to school, you miss a day of learning. Mr. Sherburne: I hear what you are saying. But if you disagree (with our decision), you have the right to stay home. Eagle Times: It must be difficult to please everyone. Mr. Sherburne: It's not easy but it comes with the territory... today was a pretty easy call.